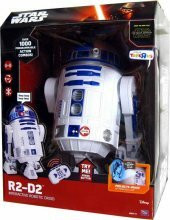 Engage in galactic fun with the Star Wars R2-D2 Interactive Droid, which features a remote control that commands the droid and initiates over 1,000 action combinations for never-ending fun. R2-D2 will respond to you with voice-activated talking and his head turns during entertaining sound effects. 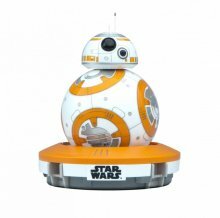 With the push of a button, have the droid move forward, backward, left or right and watch the robot turn in any direction for ultimate interactive excitement. Projects image of Princess Leia on the wall.